Are you planning on spending some alone time with your sweetie pie? 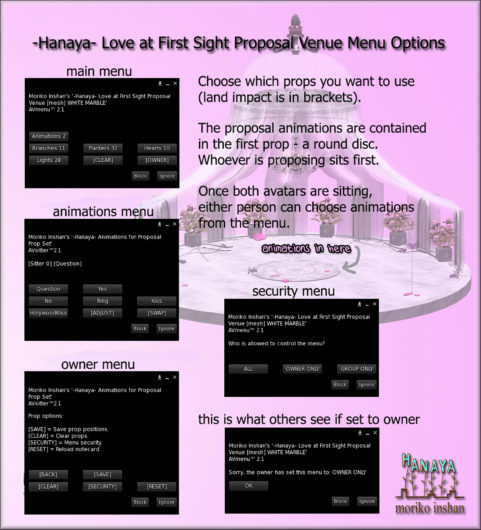 If so, the new release from -Hanaya- You + Me = Love set might be a cute addition for Valentine’s day. The complete set is 100% mesh and has a Land Impact of 14 PE. It consists of a texture change Ottoman with animations, a base with a rose petal texture, mesh piles of rose petals, a bottle of champagne in an ice bucket with flutes and 3 heart shaped candles with flame. 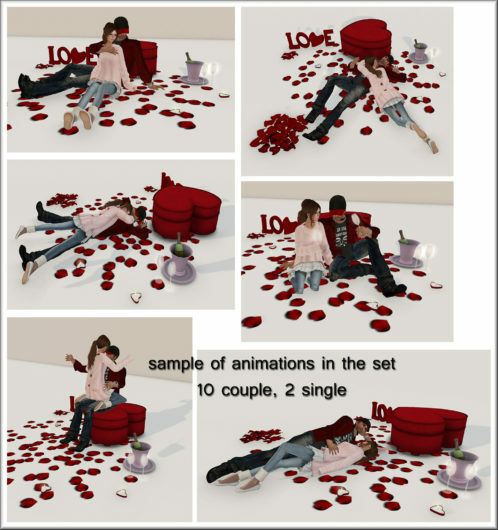 There are 10 couple animations, and 2 single ones. Some of the animations ask for permission to attach (a rose and champagne flutes). All props are mesh. 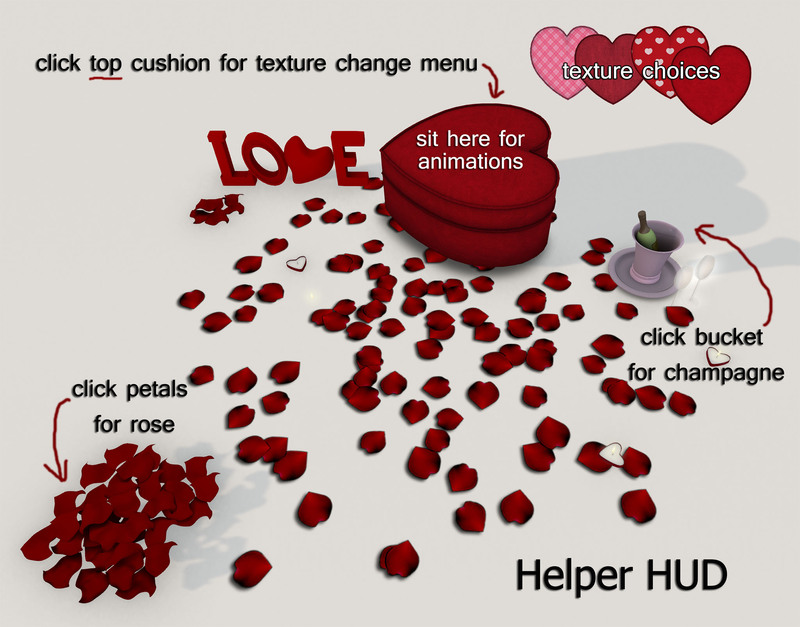 You can also click the champagne bucket and the pile of rose petals to get the props even when you are not using the animations. 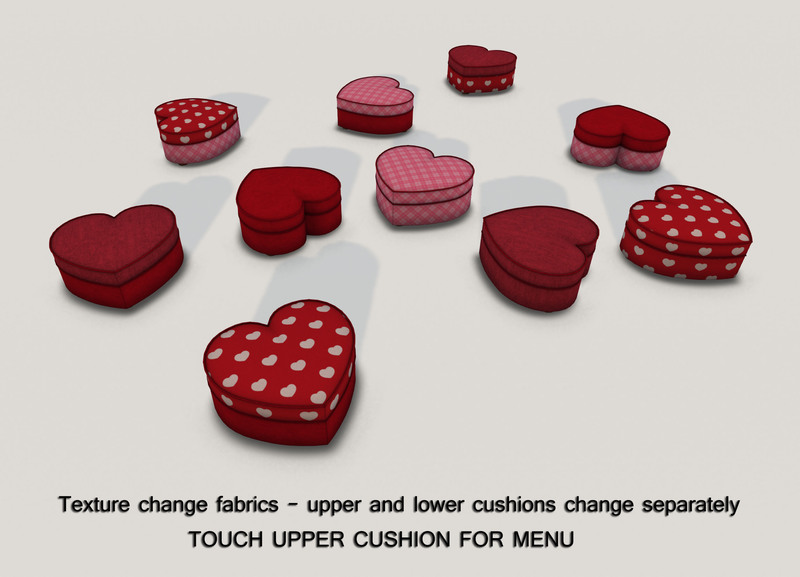 The ottoman has a texture change menu that lets you change the top (upper) and bottom (lower) cushions separately. Just touch the TOP cushion to pop up the menu. Here you can also change who has permission to change the textures. 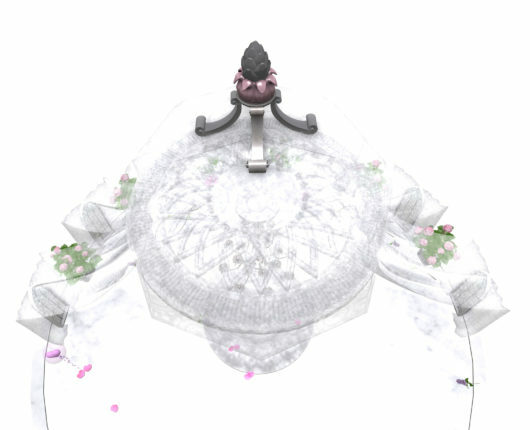 Now on display at -Hanaya- in-world store and also available for purchase on the Second Life Marketplace. A 50% discount to our VIP group members until Sunday, February 8th. This entry was posted in Product Announcements and tagged Valentine's Day on February 7, 2015 by moriko. Just a quick post with a little Valentine’s Day decor, cause you can never have enough pretties. Gives a yummy long stemmed rose on touch to anyone. How sweet is that? On display at -Hanaya- in-world store and also available on the Second Life Marketplace. This entry was posted in Product Announcements and tagged -Hanaya-, Valentine's Day on February 5, 2015 by moriko.